The Terrif DC-7 Bullet was created for use in the shallow waters during the day where anglers prefer a somewhat smaller silhouette. The magnet assisted weight transfer system in the 75mm and 10.2g body helps the lure bullet through the air to reach the unreachable with ordinary small plugs. In addition, we have improved the darting width and sharpness of action applied by the anglers rod work. This side to side darting action is a very effective method to induce bites in the shallow day game. The small new body helps for a more aggressive style of fishing approaching the shallows and casting tight against the structures. The DC-7 has a similar action pattern to those standard minnows. It is a user friendly model for beginners to experts, where you will be able to feel the current against the lip otherwise difficult to sense with lipless models. The most effective technique when using the DC-7 is to naturally drift it in the current. It is able to trace your target range even when your lure turns against the current. We have realized a stable action response even at high speed retrieval thanks to the magnet assisted weight system and well balanced body design. 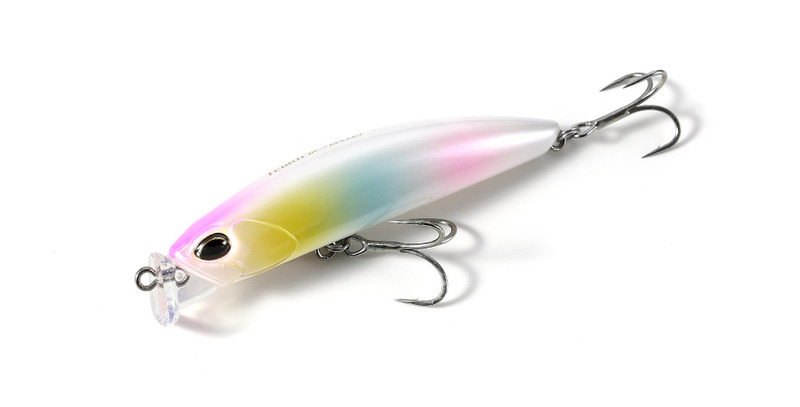 This lure will replace those lures that dive too deep or lipless minnows that jump out of the water at high speed retrieval. Anglers will be able to stage a sharp side to side darting action with the use of their rod work. This can be said to be one of the most effective methods for the shallow day game. We have created lift in the tail section through hydraulic pressure against the lure, allowing the lure for a more efficient initiation of action.